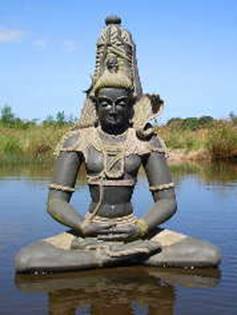 Aged about thirty, Gautama Siddartha (Sanskrit: Siddartha meaning: ‘the Achiever’. Later named the Buddha (or Knowledgeable One)), called the Sakyamuni (meaning the Scythian (!!) recluse) was as distressed as are most smart but pampered, sheltered and thoroughly bored upper middle class 30 year olds who live at home with dad, mom, the wife, the kid and the cat. So he quit his parent’s home to discover the cause of his distress and the way to its elimination, in the process becoming the prototype seeker of the happy, because true self (and which, sadly, he discovered didn’t exist as an abiding essence). After about 7 years of fruitless endeavour he eventually realised that his distress resulted from attaching to (or craving for) what (i.e. a self that) is transient and relative, hence beyond ownership and control. He universalised his personal (??) predicament and understood that since no creature (to wit, ‘arisen thing’) could be permanently master (i.e. owner) of his or her self, distress (Pali: dukkha ≈ sorrow), i.e. actually the biological signal for system’s failure, was inevitable for all. The Buddha spent the next 40 years of his life explaining the fundamental origin of dependence (or relativity) and of changeability (i.e. impermanence) and of the distress they cause. He also invented a vast number of physical and psychological techniques, including verbal tranquillisers (see the mantra at the end of the Heart Sutra) that served to reduce and /or eliminate distress. Alas, he never did ask the crucial question as to the Guide & Control function of unpleasantness (i.e. distress, sorrow and so on, to wit: (Pali) dukkha) and pleasantness (i.e. happiness, joy and to forth, to wit: (Pali) sukkha). Just about everyone experiences the distress not just of being wholly dependent and without the power to shape one’s life but also of the awful changeability and unpredictability of life. That experience is common to the bulk of humanity being crushed by the realities of existence in a predatory world. Of course the Scythian Recluse, i.e. latterly called the Buddha, got the cause of suffering badly wrong. But it did become a popular sell. Clean observation and a shave with Occam’s Razor suggests that happiness signals success, i.e. at goal attainment, irrespective of the goal and that unhappiness signals failure to achieve the (i.e. any) goal. Simply stated, happiness (, i.e. positive stress Pali: sukkha) and unhappiness (i.e. distress. i.e. negative stress) (Pali: dukkha) are biological success-failure signals.